Hi! Happy Spring! I have a little announcement today and a freebie for you. Even though our weather is not quite cooperating this week – Spring is officially here. I’m in the mood for floral patterns, lighter colors and lots of flowers! So one of the things I’ve been working on behind the scenes is learning the ins and outs of Photoshop. I’ve become obsessed with making patterns and printable prints and things. I love the idea of instant home decor. You can take these printables and print them at home, online or at your favorite local print shop. Then you just frame them or use them however you like! It’s a great way to change out art if you get bored easily or want to change them with the seasons. It’s also an inexpensive way to get unique art up on your walls. And – it’s instant! What’s better than that? 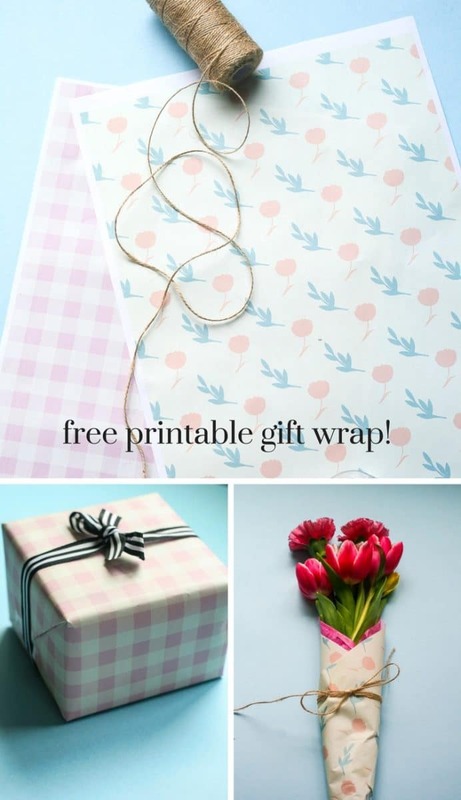 In honor of spring (and upcoming mother’s day too), here are two printable gift wrap sheets for you. These are both 11×17 inches but they will print on 8.5×11 inch paper too. They are jpg files. They will print out with a small white border around them which you can cut off if you want. I used the light pink gingham one to wrap a cute little box. You will laugh but we don’t have a printer at home! ha. I took it to my local fed ex and used the self service printers. Only a few bucks to print them out. I used the floral pattern one to wrap some spring flowers. All of my printables are housed in my free printable library for subscribers. To get access to the free printable library, just enter your email address below this post to subscribe to my email newsletter and you’ll be sent the password. The library includes meal planners, daily planners, project planners, to do lists, wall art and more! Already a subscriber? You can find the password and link to the library at the bottom of every email update I send. If you have any trouble, please just send me a note! To wrap the flowers, I just arranged a bunch of flowers and cut them down to the size I wanted. Then I laid them on top of tissue paper and my wrapping paper – lining the flowers up up with one of the corners. I wrapped the tissue paper around them and secured it with tape. I repeated the same steps with the wrapping paper. I actually ended up cutting off the border and cutting the paper into a more square shape. I used some jute twine to tie a bow around the bouquet. Oh yea, and now for my announcement. I opened an Etsy Shop! Yesterday! Right before company is due in town! Because I’m crazy like that! And I like exclamation points! A lot! My Etsy shop is called decor hint designs. I plan on selling my own printable wall art, digital papers, maybe even planners and planner stickers (maybe). I’ve learned that besides blogging, I am really really passionate about graphic design and photography.